The flagship Focusrite 26 in / 28 out interface has been designed with the permanent racked studio install in mind, featuring extended ADAT i/o, and separate rear panel inputs for mic and line, as well as dedicated phantom power, phase reverse and high pass filters on every channel. The 26-in, 28-out Clarett 8PreX combines eight mic preamps, class-leading digital conversion and extra-low round-trip latency -- enabling DAW plugins to be used while monitoring recordings. Clarett's mic pre offers superbly low noise and distortion, plus the "Air" effect that models the sound of Focusrite's renowned ISA transformer-based preamps. Complete with Focusrite's precision 24/192 conversion offering up to 119dB real-world dynamic range, there's never been a better, faster, or easier way of getting audio into or out of a DAW. 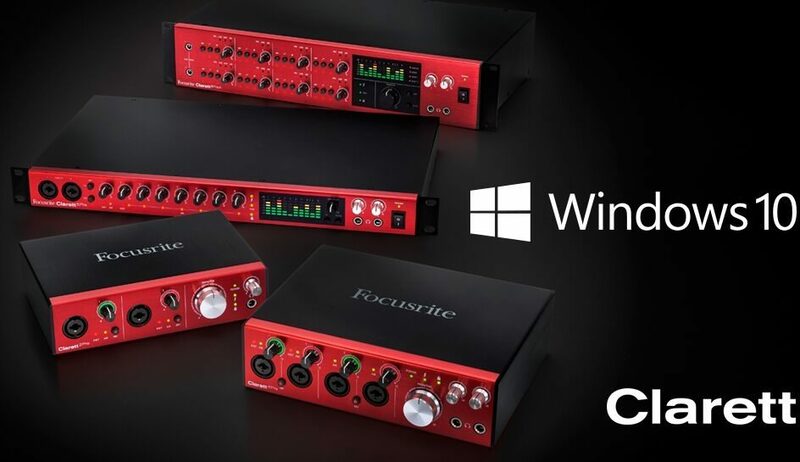 Designed primarily for permanent studio installation, Focusrite's Clarett 8PreX Thunderbolt audio interface offers an impressive 26 inputs and 28 outputs, including eight analog inputs, 10 analog outputs, stereo S/PDIF I/O, and 16 channels of ADAT I/O for the connection of addition inputs and outputs such as a multichannel digital mic pre or an external D/A for additional line outputs. The 2U rack-mount unit combines eight Clarett mic preamps with class-leading dynamic range conversion and extraordinarily low round-trip latency -- so low that plugins can be used, in real time while monitoring recordings through the DAW. The Clarett mic pre offers superbly low noise and distortion, plus the unique, switchable 'Air' effect that models the sound of Focusrite's renowned ISA transformer-based preamps. It also features gain controls with a special law that makes changes smoother and more precise. The Clarett 8PreX, like the rest of the Clarett range, includes class-leading precision Focusrite digital audio conversion with up to 118dB (A/D) / 119dB (D/A) real-world dynamic range. This is combined it with the lowest round-trip latency available -- making it possible to monitor recordings via effects plugins in real time on the DAW such as reverberation, for the best possible recording environment. A central metering and monitoring panel provides ten 6-segment LED meters covering analog and digital inputs and monitor levels, with a large-diameter monitor level control knob plus mute and dim buttons. The two independently-controlled headphone outputs on the front panel have enough level to drive even high impedance headphones providing suitable monitoring levels. A software mixer, Focusrite Control, is easily configured for monitoring and routing setups. 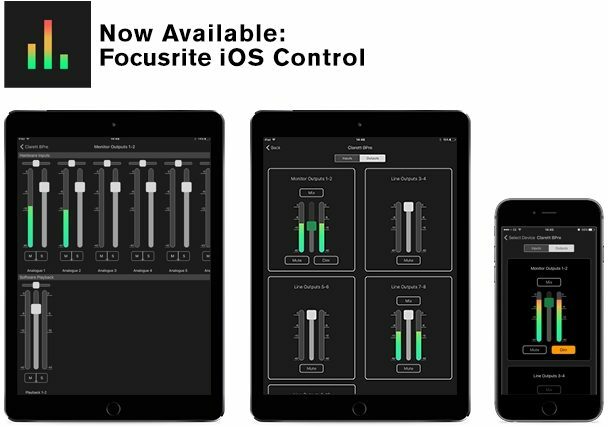 Focusrite Control is simple and intuitive to use, providing immediate access to internal hardware functions. Every Clarett includes the Red 2 & Red 3 Plug-in Suite, which accurately models Focusrite's classic Red range equalizer and compressor hardware. In addition to the Red 2 and Red 3 Plug-in Suite, all Saffire audio interfaces include the Softube Time and Tone Pack. This is a unique plug-in bundle, comprised of Softube's world class TSAR-1R reverb, Tube Delay, and Saturation Knob. Word Clock I/O is provided, allowing the Clarett 8PreX to either provide the master clock for the system or to be clocked from an external master digital device. There's never been a better, faster or easier way of getting audio into or out of a DAW. 26 audio inputs and 28 outputs within a 2U rack space, including 8 analog inputs, 10 analog outputs, stereo S/PDIF I/O, and 16 channels of ADAT I/O. Connect up to 16 more mic preamps over ADAT for a 24 channel microphone setup. Specially designed for studio installation, Clarett 8PreX includes separate rear panel inputs for mic, line and instrument, as well as ADAT I/O to add 16 more channels, dedicated phantom power, phase reverse, and high pass filters on every channel. Latency is the delay to a signal as it passes through your DAW system from interface input to interface output. Clarett Thunderbolt offers the world's shortest. Signals go round so fast that you can record and monitor in real time through your DAW with plugins such as EQ or compression. The mic pres have been designed especially for the Clarett range, with plenty of gain, yet low noise and distortion. In addition, a special "Air" feature switches in an analog model of the classic transformer-based Focusrite ISA mic pre. Instrument inputs feature extra headroom to handle the loudest pickup. Central panel provides analog and digital input levels, and main monitor outputs, via a 6-segment, multichannel hardware meter. zZounds is an authorized dealer of Focusrite products. This review has been selected by our experts as particularly helpful. "Focusrite Clarett 8PreX Review from Mike Snoody"
Overall: I have used other focusrite interfaces before and I was always impressed with the bang for buck they gave you but using the sapphire pro40 at one point and then going into my local studio that has burl, lavry, avid and apogee converters to choose from I realized what I was missing. I went ahead and upgraded to the Avid HD omni for a while but I grew tired of being limited to 8 channels REAL quick as I record live drums a lot. My friend told me about the Clarett range and at first I was skeptical because of how cheap they were. I didn't want to backtrack in terms of conversion quality which was the most important feature in my interface for me. He finally took me down to guitar center where his friend was the pro audio manager and we were able to do a shoot out with the Clarett 8preX, Avid Omni, UA apollo 8p, and the lynx aurora 8. I was just floored by how well the Clarett sounded. I won't say it sounded "better" than any of the other units listed above, but it definitely wasn't any worse than any of them either. In fact, when listening between the Clarett and Omni I preferred the Clarett's sound over the omni. As for the lynx and the Apollo, I had never heard them before that day and I have never used either since but from what I can remember from that day they both sounded great, but not any better than the Clarett which was over 1000 dollars less. The Preamps on the Clarett 8PreX are not bad. I have some outboard pre's that I use but I had to use all 8 pre's on the Clarett recently for a drum recording and I was very happy with the results I got through them. I ran my Overheads, Spot mics for Ride China and Hi hat and 2 room mics through the Clarett pre's and I used the Air mode feature for everything except the rooms. The Air mode literally does what it says, adds air to your track. It is a great feature and while I wouldn't use it on everything, I could certainly see myself using it on acoustic guitars, some vocals, string instruments and piano, cymbals, etc. All in All I am EXTREMELY happy with the Clarett and it really sounds great regardless of the low price. 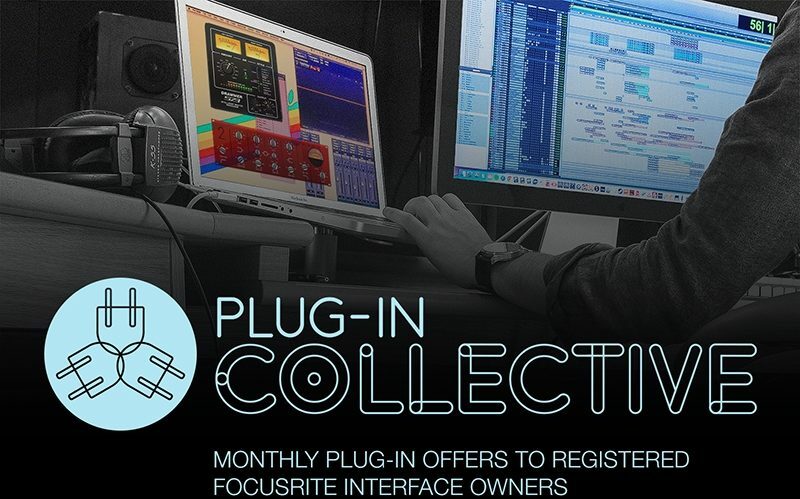 Focusrite really nailed this one and if you don't feel like spending 2k+ on converters only but still want the conversion quality of 2k+ converters for under 1000 dollars, go with one of the Clarett interfaces.